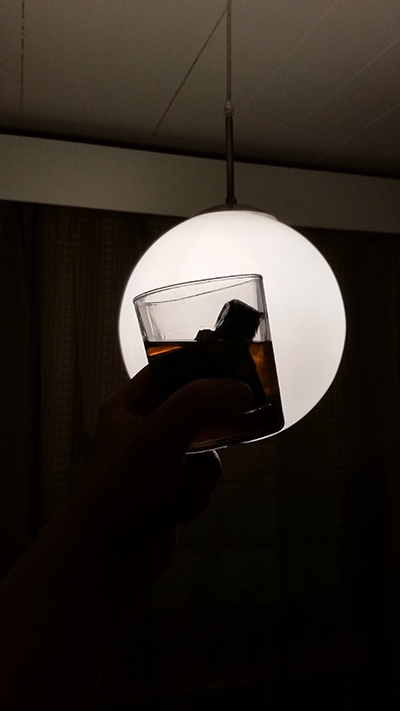 I received whisky stones as a Father’s Day present from my spouse and I have been absolutely loving it ever since. Along with some Jura Superstition, a whisky sausage and an overwhelmingly nice mirror with my sons handprint and the message “ISI” (Daddy in Finnish), I got a box of whisky stones. The box contained 10 pieces of rocks to put in your freezer and cool your whisky. You can buy whisky stones similar to which I had from here . For European customers I’ll recommend Amazon UK, click to buy them from here . I got these for Father’s Day – Jura Superstition 0,2 liter and some whiskey stones. Whiskey stones (with an e), like the ones by Sagaform were called, really made a difference on my whisky tasting. Scotch on the rocks felt much better, because there was no melting ice diluting the whisky. The cooling effect does reduce powerful aromas but then again, I am willing to take that hit if I’m drinking a poor whisky with no special aromas. This really isn’t any sales talk. I used to drink lots of whisky with ice included. The kind of whisky made for casual consumption, cheap blends or bourbons, that are not necessarily for whisky enthusiasts. I just happen to love whisky that much that sometimes I have to go with a small budget. Then you’ll probably end up with a bottle of some decent stuff, or if you’re having bad luck, the whisky is very poor. In times like that, ice cubes usually were my choice to make the whisky more enjoyable. Even though I was aware of the dilution. I just hadn’t figured out a better way to enjoy the bad ones. Along came my spouse, with her perfect gift for a whisky fanatic. First the whisky rocks gave the drink a small dose of industrial smell, but fortunately those aromas faded away over heavy use. By heavy use I mean 3 to 5 pours, with a dash of heavily peated whisky. The smoke aromas pretty quickly made the whisky stones lose their industrial feel. Here you’ll find other sets of whisky stones from Amazon – the premium versions with nice rounded edges, so that the stones don’t harm your glassware. 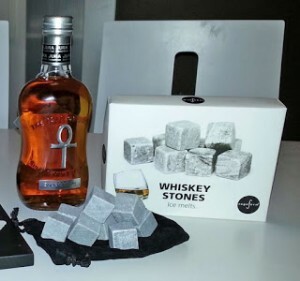 Check them out from Amazon UK as well. .
Whisky stones are not a new innovation. There’s lots of history behind cooling your drink with rocks. The Vikings used to cool their alcoholic beverages with stones from the shores. There’s even been suggestions that Vikings might have made whisky before the Irish and Scots. Mark Reynier, the former CEO of Bruichladdich distillery, posted an article about the origins of “Water of Life”. The traditional story is that Irish missionaries brought whisky distillation to Scotland. But in one of Mark’s blog post, he comes up with an alternative, saying that it’s not impossible that the Vikings brought the whisky distillation craftsmanship to Scotland. One thing we can be sure of – they cooled down their drinks with actual rocks. Whether it was a stone from riverbanks or from a spring, it was cool coming from the water from nature. Scottish farmers used to do the same, even in modern times. Where to buy whiskey stones? Whiskey stones are sold in lots of places, from super markets to gift shops and of course you’ll run into them all over the web. Amazon sells lots good whiskey stone sets and they do deliver fast. So I’ll recommend you checking the lowest prices from here and buying whiskey stones delivered straight to your home. Amazon does offer the premium rounded soap stone whiskey stones as well. Whiskey stone set usually contains 8, 9 or 10 soap stone cubes in a velvet storage poach. Usually the whiskey stones are 2cm x 2cm x 2cm cubes so you can fit all of them in one traditional whiskey tumbler glass. I personally prefer to put all of the whiskey stones in my glass simultaneously. But that’s just my style – my glass is usually so full that it needs many cubes to get the whiskey cool. I also stuff the glass full of whiskey stones because then they will not move in the glass too much. So you don’t end up hitting your teeth with the rocks. Whiskey stones are easy to use. It’s good to wash them before you place them in the freezer for future use. I found it handy to use heavily peated whisky with my whiskey stones – just to get the artificial aromas away. Peated whisky helps the rocks get aromas of whisky in them. And as mentioned before, whiskey stones will not dilute your whiskey – so no more watery whiskies after you start using soap stone from the freezer. The shape is usually cubic, cheap ones might have sharper edges than the premium whiskey stones – which have rounded edges. So if you want to keep your glass safe from scratches, buy the premium whiskey stones. And keep in mind, that whiskey stones can be used in any kind of drink. From spirits to fresh orange juice or even white wine. Actually I’ve heard that the stones are very useful for cooling wine but I myself am not a wine drinker, so can’t tell you if they really work. So like I mentioned before, I’ve really grown to like whisky stones. I am more than satisfied in this product. If there’s anything more I’d like this product to offer, it’s probably those rounded whisky stones, just to keep my favorite tumbler from scratches. I do have a favorite Scotch glass, which I use every time with cheap whisky, along with whisky stones. That’s why I’ve added to my gift list the premium whisky stones. Round edges will hopefully keep my whisky glasses in good shape. I’m not saying that the low priced whiskey stones would do too much harm, but I guess in heavy usage over the course of many years, the glassware might take too many shots from the rocks.